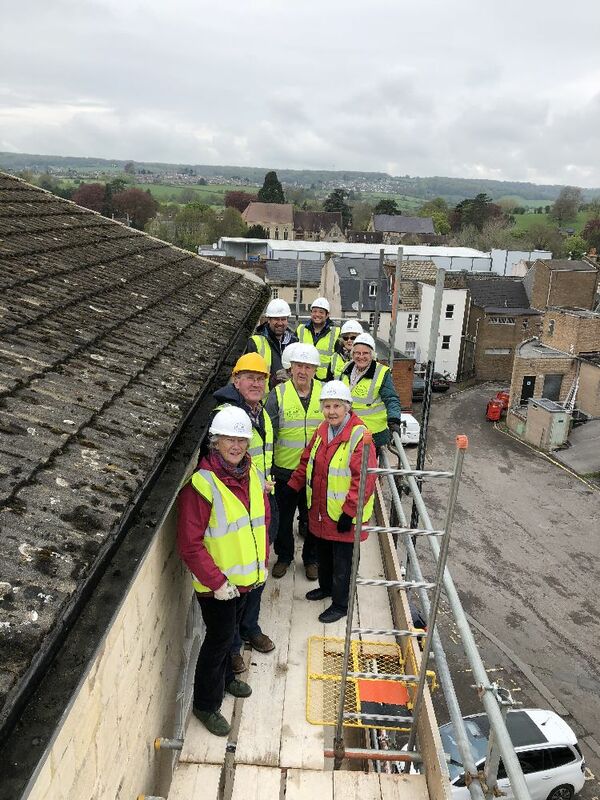 On Saturday 28 April eight members of Stroud Civic Society were given a hard hat tour of Stroud Congregational Church, led by Darren and Richard of Splitlath Building, a firm which specialises in restoring historic structures. 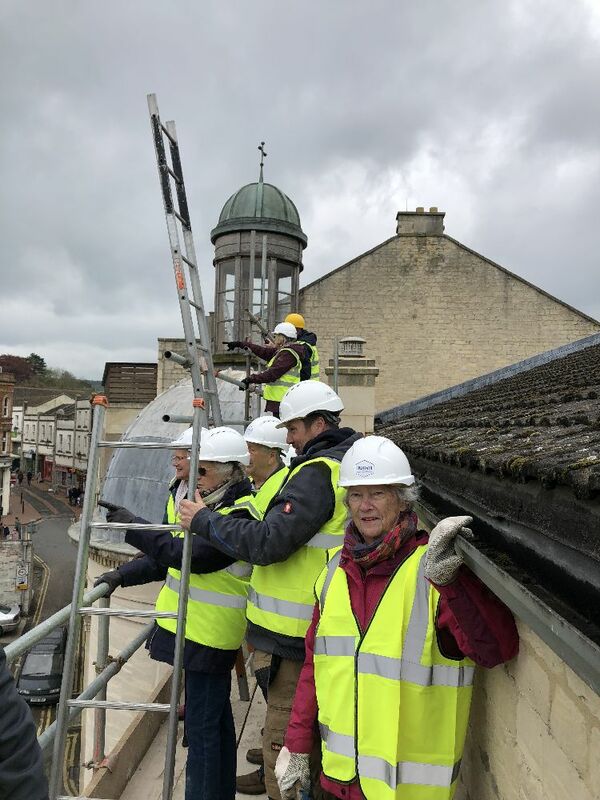 The Grade II* Listed Building is being restored and made safe using grant aid from the Heritage Lottery Fund and the Gloucestershire Historic Churches Trust. 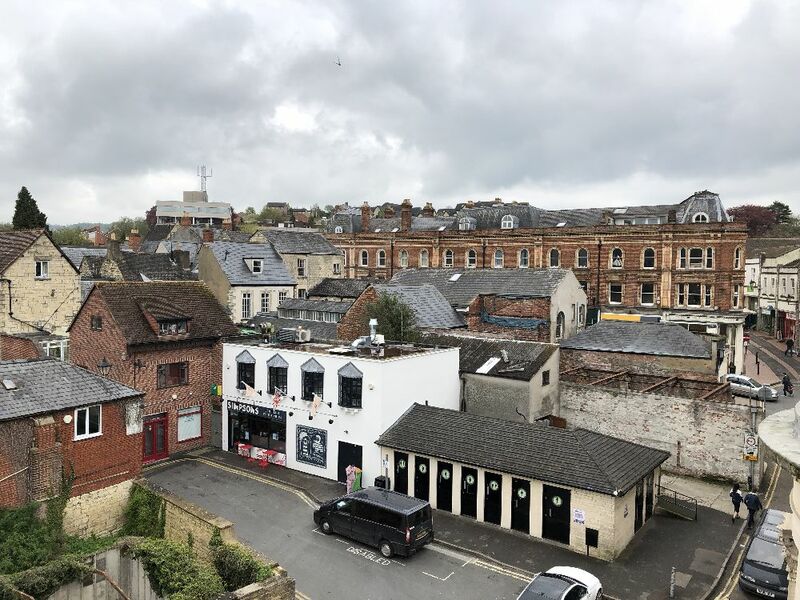 Some history: Designed by Charles Baker of Painswick, the building’s foundation stone was laid by Samuel Marling on 8 June 1835 and opened on the 27 September 1837. Further galleries were added in the 1850s and and three apse window openings were sealed to accommodate the organ loft. 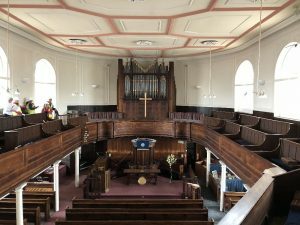 In 1889 other chapel windows were re-glazed in coloured glass, and in 1919 the pews were altered, electric lighting fitted and a First World War memorial tablet erected. Further renovation and repair work took place in 1870, 1875, 1888, 1897 and 1929. 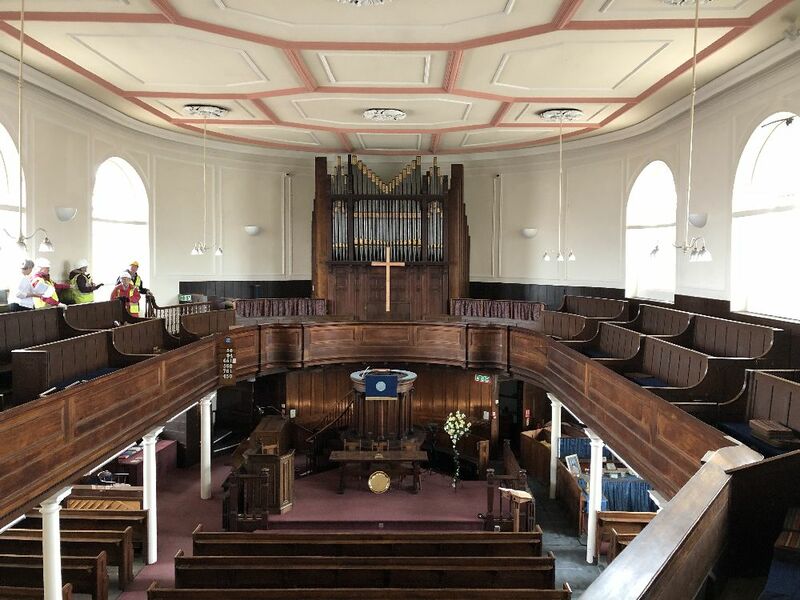 In recent years a lift has been installed, the cupola replaced, the church hall refurbished and a stair lift installed in the stair tower. 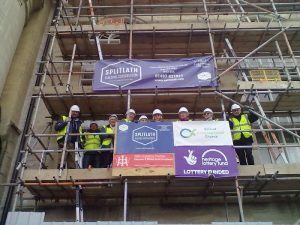 Our tour and the ongoing restoration works: We had been instructed to wear walking shoes and wear gloves, and, after we had been dressed in our PPE – personal protective equipment – of hard hats and hi-viz jackets, the eight of us were taken outside to the rear of the building, where Darren and Richard explained that Splitlath had been contracted to take out eight old windows and refit eight new ones, as well as checking for blown stonework and pointing. As they carried out their work, they passed on to the architect any items they discovered which they felt needed or would need attention, but could themselves only carry out the work they had been contracted for as set out in the specification. The windows taken out had been made from soft wood, much of which was rotten, and were being replaced by Entandrophragma cylindricum, commonly known as Sapele, a hard wood from a tree native to tropical Africa. Hard wood has been chosen for these very large windows in order to cut down on future maintenance. 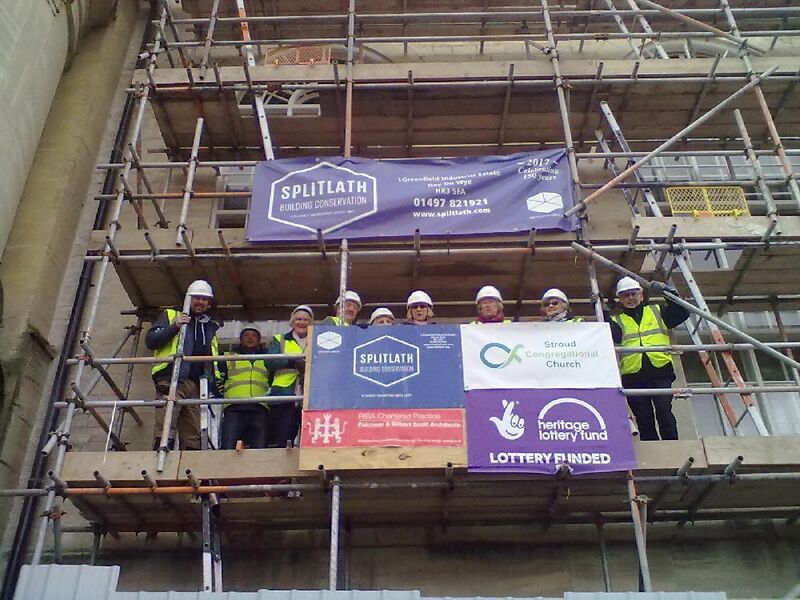 We climbed up the first ladder attached to the scaffolding and stood by the first window we came to. 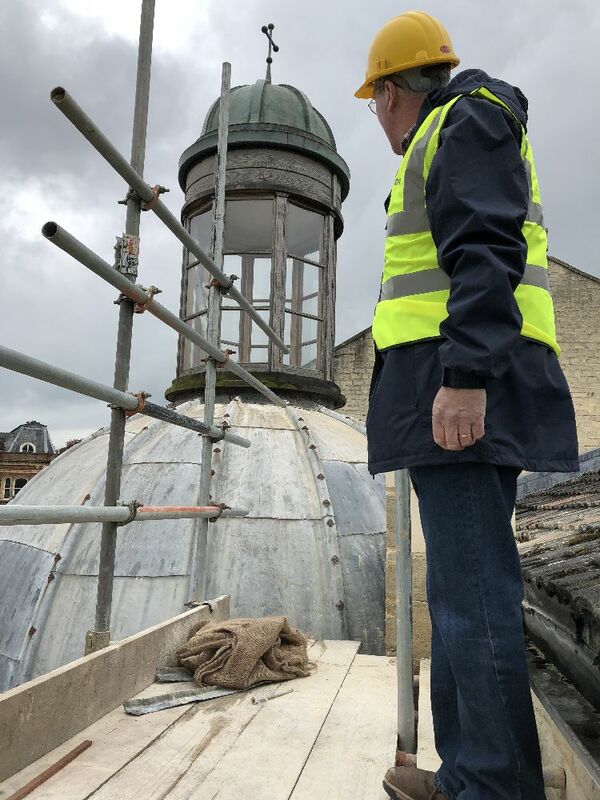 It was explained to us that what we had thought was one window was in fact four sections bolted together, each of which was lifted in position by a hoist. If the window had been one entire window it would have required a crane to lift it. Each window mirrors another window of coloured glass on the inside of the building, thus effectively creating a secondary glazed window. After the sections are bolted together to make the one window, the glass is inserted, putty and glazing tape added, and then, 10 days later, the glazing bars are painted; the ten day wait is to ensure that the putty is hard enough to take the paint without any problems. At the back of the sections joins, there is a strip of plyboard to stop any damage should there be penetration by rain at some future date. We climbed further ladders to the top of the building, almost level with the lantern on top of the cupola. At this level we could touch the plastic guttering and look at the ugly and very heavy interlocking concrete roof tiles, which have replaced what was probably a much lighter-weight slate roof. It is obvious that there is damage to the felt and there has been some water staining to the stone. 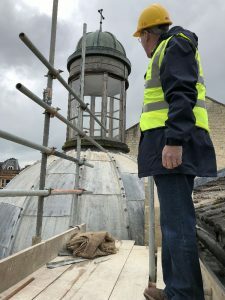 Once we returned to ground level, we went inside the building to see the work Splitlath have carried out to the rotunda staircase which is a staircase entrance to the chapel from Bedford Street. They have replastered the wall and added a new stair rail to parts. From the stair turret we went into the chapel, which is an incredible part of the building. Please can I impress upon members of the Society, and their friends, if they have never seen this chapel, please make an effort to do so. It is a Stroud jewel. At the end of the tour we went downstairs to the church hall where Kay, the caretaker and other members of the congregation were waiting to serve us tea, coffee and biscuits, and to get us to fill in the inevitable feedback form. 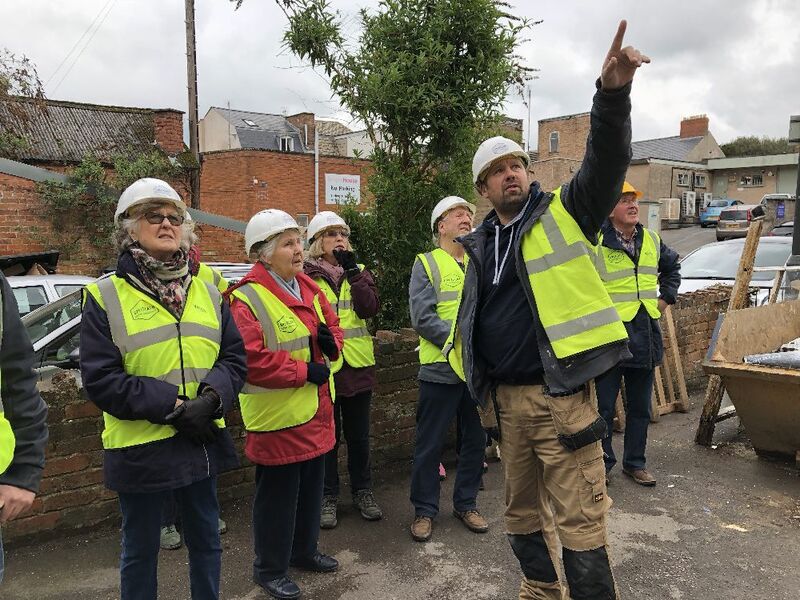 The whole event was a superb tour and we can’t thank Darren and Richard enough for giving up their Saturday afternoon, as well as thanking the members of the congregation who were kindness personified. 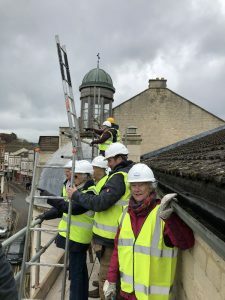 They are trying to get the building known to the people of Stroud. The light and airy church hall is a really good location for talks and suchlike and, besides being well equipped, is very reasonably priced for hire; there is a further small room, the Jubilee Room which contains a small kitchen and which is suitable for smaller meetings, again very reasonably priced for hire. This entry was posted in 2018, events, stroud by Civic203Admin. Bookmark the permalink.